With real fruit juice, rosehip purée and elderflower extract. High in vitamin C, zinc and folic acid. Vitamin C, folic acid & zinc help your immune system to function. 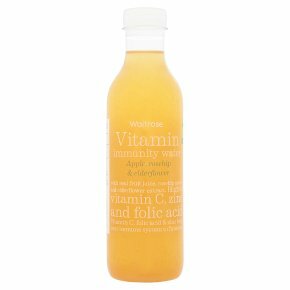 INGREDIENTS: Water, apple juice (20%), agave syrup, rosehip purée (2%), vitamin C, acidity regulator (citric acid), elderflower extract, zinc, folic acid.